Erected by George Finlayson in memory of his parents. 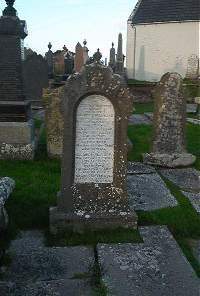 George Finlayson, crofter of Landhallow, died 22nd December 1867 aged 88. Wife Janet Finlayson died 26th Febuary 1864 aged 78. Son Alexander Finlayson died 17th October 1880 aged 61. Son George Finlayson died 26th May 1900 aged 77. Daughter Charlotte Finlayson died 12th March 1918 aged 92.